Exhibition of Carrolup art at Boans department store, The West Australian , 23rd October 1947. The boys from left to right are Claude Kelly, Barry Loo, Reynold Hart and Parnell Dempster. Noel & Lily White Collection. How did the drawings of the Aboriginal children of Carrolup first become known to the general public? Here is a summary of some of the initial ‘successes’ of the children, which you can follow in more detail by reading the newspaper article to which we have linked. You can also hear some reflections of Noelene White, daughter of Carrolup teacher Noel White, about the public’s reaction to the children and their artworks. Noelene was filmed by my colleague John Stanton in 2006. The children’s drawings first attracted attention at the Katanning Show in November 1946, as indicated in my last blog. ​Three children (Reynold Hart, Dulcie Penny and Vera Wallam) had their articles accepted in the Lord Forrest Centenary Booklet – in competition with other children from all over the state – whilst Parnell Dempster had a drawing accepted. Only one other school in Western Australia had more submissions accepted than Carrolup Native Settlement School. Vera and Parnell won two of the ten one guinea prizes that were offered. The children’s drawings shown in the Lord Forrest Centennial Exhibition were seen by thousands, and attracted the attention of the press. Max Praed acclaimed the art and the Whites’ education programme in a Sunday Times newspaper article. Thomas Sten, Principal of the Teachers’ College at Claremont, asked if he could display some of the children’s art on the walls of his college. 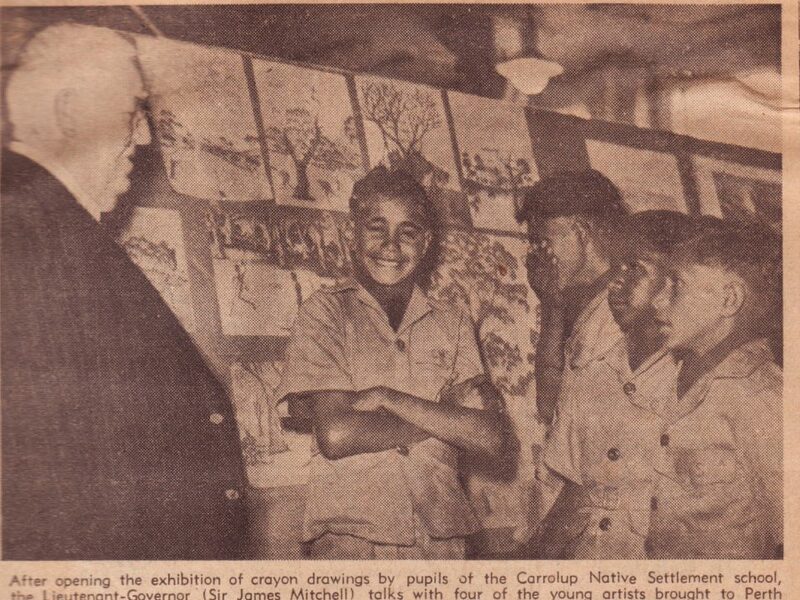 More attention was focused on the children’s drawings in the 1947 Katanning Show. 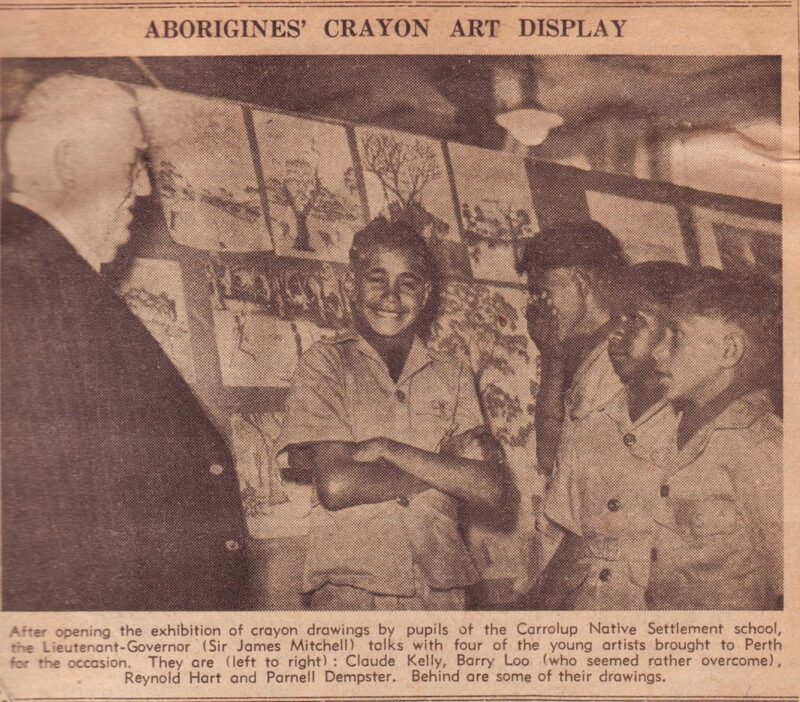 In 1948, doubters at a teachers’ conference held in Albany were silenced by a stunning display of drawing given by three of the boys, Parnell Dempster, Reynold Hart and Barry Loo. All 96 artworks exhibited soon sold, raising £24 (worth $1,450 today) for the school.